Emirates Team New Zealand will be calling on Spark NZ – and 5G – for connectivity as it gears up for the 2021 America’s Cup, which the Kiwi team today dubbed ‘basically a technology arms race’. Spark’s role as official telecommunications and connectivity partner for the 36th America’s Cup, will see it providing telecommunications and digital connectivity on and off the water. The deal also gives Spark exclusive rights to provide telecommunications services and connectivity within the areas controlled by organising company America’s Cup Event Limited and Challenger of Record 36. Emirates Team New Zealand told iStart 5G, with its expected higher speeds, greater capacity and better performance, will enable Emirates Team NZ to benefit in terms of design and development when testing the boat. 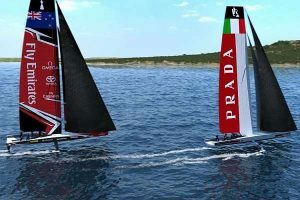 “There is huge scope for increased efficiencies in the on-water connectivity between the race boat and the designers on chase boats as well as on shore. “There are literally thousands of points of data delivered from sensors off the boat that are crunched real time and the delivery and connectivity of this mission critical data is certainly an area that Spark will be able to help with. Emirates Team New Zealand says 5G’s benefits will extend beyond the team, enabling ‘world class’ delivery of media and broadcast of the event. “From a general spectators point of view it [also] means being able to supplement the live viewing with real-time data and footage coming off the water, as well as AR and VR experiences, all of which will enhance the viewer experience on the water, in the venue or simply at home. Emirates Team New Zealand CEO Grant Dalton, says seamless connectivity can make a big difference in gaining a competitive edge in the competition for the oldest trophy in international sport. “As America’s Cup racing becomes more and more driven by technology innovation, the crew on the boat and the team back at the base rely on the immediate availability of real time data to get the best performance on the water,” he says. Mark Beder, Spark technology director, says 5G is arriving at the perfect time to maximise opportunities for the America’s Cup. “We want to make the 36th America’s Cup a showcase opportunity for many of the advances that will be enabled by 5G – and our partnership with both Emirates Team New Zealand and the event itself will put us in the best position to deliver to this brief,” Beder says. Spark’s new 5G Innovation Lab, due to open later this year just a few hundred metres from the Emirates Team New Zealand base, will be used to showcase the 5G’s potential and enable companies to test and develop future applications over a pre-commercial 5G network. Spark says the lab’s location close to the Emirates base will enable it to start testing real world applications of 5G in live environments later this year. The telco isn’t revealing what it will be showcasing at the lab, saying it’s keeping it under wraps until launch, ‘but there will be some exciting applications to experience’. Spark switched on its first live 5G mile test site in Wellington earlier this year, with the site achieving speeds of more than nine gigabits per second – more than nine times faster than the maximum speeds available to consumers with residential fixed line fibre and 90 times faster than today’s most prevalent UFB 100mbps service. Spark says it is on track to start providing 5G services to both consumers and businesses from 2002. “Our technical and network planning is advancing,” a spokesperson told iStart. Earlier this year the company flagged its concerns over ‘an absence of any clear government policy’ on 5G spectrum. It’s an issue that clearly still rankles, with the spokesperson today noting Spark is reliant on spectrum availability and ‘will work with the government to participate in whatever approach they decide is appropriate to free up and auction this spectrum’.